The boy had been here in the dense jungle wilderness for three days and counting. It had only been three days since he had awoken in this place with no memory of who he was. It was completely bizarre and he had no idea what to do. A small bug like creature had been there, he seemed to understand it's clicks just like human speech. The boy had given the creature the name "Ikimono". The creature could not tell him what was happening and seemed to be in the same predicament that he was in. It was a troubling event, but at least they had eachother. The pair of them had spent the last few days securing the basic requirements for living. A nice little hole underneath a large umbrella of tree roots made for a cozy hideaway. A nearby stream gave them a fresh water source for drinking and washing. Food had been a little harder, finding edible fruits and roots was a challenge. Ikimono seemed to have some innate knowledge when it came to these matters, such as "don't eat the little red berries". When he was asked, Iki wasn't able to be explain where he had learned these things from. The boy himself had some internal direction, whether it was instinct or something else, he could not tell. Man I am hungry. I don't want any more old dirty roots to chew on either. I want some meat. The boy grumbled in unison with his stomach. Ikimono gave a few clicks in agreement and scuttled around his neck. The pair were out about a kilometre from the home base, out searching the vicinity for food. They were slowly mapping the area, expanding the known universe with every passing day. There were birds up in the trees, but he doubted that they would be able to catch them. Just as the young male was about to suggest giving up for the time being, he spotted a little grey rabbit dart across their path. Oh did you see that? The little bug chittered in excitement. Yeah! But how can we catch it? Ikimono climbed up on top of the boy's head. There it is, maybe try and sneak up on it? The boy secured the cap on his head and bent over to pick up a rock the size of two fists. The target was munching on some leaves, large ears outstretched about 20 metres away. The pair of hunters remained silent as they slowly crept up on the little animal. He only took a few steps before the rabbit perked it's head up and scampered off. Dang it we'll never be able to catch it. Iki scuttled down his neck and arm and onto his hand. The boy raised it so they were looking at eachother. Maybe we can try that thing from yesterday... What had happened yesterday still scared the two of them, it was some freaky event that he would rather not repeat. Then again, he was hungry. Alright, I guess it may help. Let us try at least. The two were on the same page, infact the human and animal seemed to have the same thoughts and ideas. Again the pair found the furry target, this time keeping their distance. Ikimono and the nameless boy closed their eyes and concentrated. This had happened yesterday by accident, today they are trying to will it. They both focused solely on their task which was catching their prey. They wanted speed and lethality. Together as one, they would become something new. The boys olive skin started to bend and stretch. The little bugs body started to warp. His hand and Ikimono's body blended into eachother and their combined form shifted. The human male's clothes started to change colour. A tail started growing from the boy's back, a thick carapace grew on his skin. His arms stretched down to the floor and protruded wicked claws. His head stretched forward and stretched out into a snout, long spear shaped teeth filled his mouth. The pair had combined into something completely new. There he was, a creature with spines sticking out of it's rock hard outer skin. He was half way between a dog and a cow in terms of size and weight, but was unlike any species that could be found throughout the world. He was still. The beast that they had become was hunting, his instincts took over, crawling towards the rabbit with surprising stealth. He managed to creep up to within 10 metres, where the bunny perked up in warning again and looked the fearsome beast. It was stunned at the size of the predator, turning to run as the beast pounced upon it's kill. The claws went through the little creatures stomach and killed it instantly. It then bent it's head up to the sky and roared, the primal scream reverberating through the forest. Loud and trembling footsteps echoed throughout the eerie forest, whilst leaves and branches crumbled one after another due to the pressure that each foot was capable of bestowing upon them. There was a man around his thirties which was ceaselessly running for his own life, screaming and sweating like there was no tomorrow with each passing second; without a doubt, the lesser man was being hunted down like an animal within the wild. Behind him, there was the hunter, a raven-haired man with gleaming red eyes that kept following the trails which the man left behind, closing in distance with each passing second. No one could avoid the inevitable, and sooner or later this person was bound to fall in spite of all that constant running; that was the fate of some, and there was nothing for them to do in order to change the path on which they walked upon. Like a vicious snake, Tenzō leaped on his prey and stung the man with his dagger, a blade that had its own name, Incision; it was a clean and deadly thrust against the back of the victim’s head, and within moments a significant amount of blood gushed out immediately once the man kissed the ground with his own pair of knees. The red and warm liquid was splattered on those leaves, a considerable amount which painted the brown and green background underneath with a slightly tint of red. “I told you not to run.” the Uchiha uttered while pulling the dagger back with a quick jerk, before cleaning the blade up by dragging it on the victim’s blue and long shirt so that the blood may fade away. This blade was a gift which the man choose to keep around him at all time, and because of its size and shape, the raven-haired man was capable of using this weapon in more than one way. There was no time to rest or think about the next action, since something which the young man was not able to predict was about to arrive, something which may mark the beginning of an interesting series of events. A mighty roar echoed like thunder against those sharp ears which the man was bestowed with, assaulting the man with its terrifying presence and harshness; the Uchiha shivered at the unknown, it was a sound that he did not heard before. Without a doubt, the man had the chance of seeing or at least hearing about a large variety of animals; however, this was something that was never experienced before, even the nearby crows began scattering themselves in every direction possible at its hearing. Lions were known to rule the jungle with their mighty roar, although, this vibrating sound was totally different and much more vicious at its core. Between some trees, just a couple of feet away from the Uchiha, there was a new kind of predator which could be a bit too hard to describe with simple words. 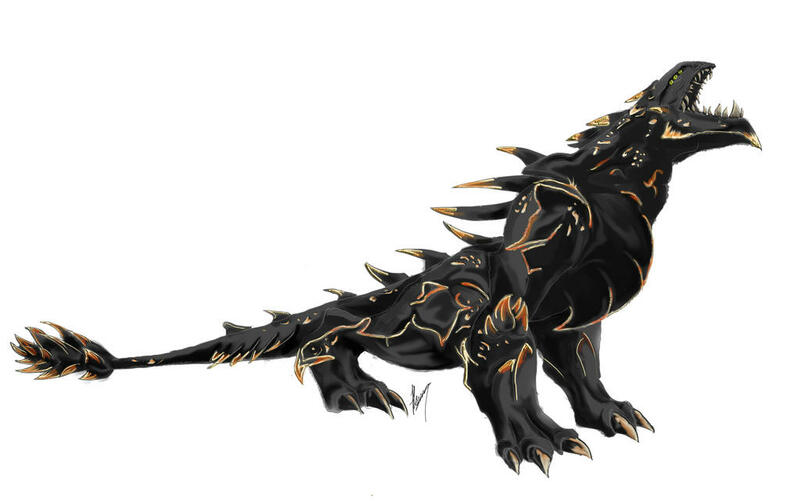 “What an interesting creature…” the young man muttered while gazing with those crimson eyes against it, eyes which slowly stared gaining back their ebony color while shifting themselves around just to that he may observe what it was trying to eat, a small and fragile rabbit. It was hard to refrain himself from laughing, since a large and majestic creature about that size was hunting down such a small, a dull creature which was probably not enough to seize its hunger. With his right hand, the raven-haired reached out for the lifeless man, dragging the corpse closer towards the large breast before throwing one or two feet away from it. “Here, eat it. That rabbit is far too small for a large stomach such as yours.” Tenzō spoke on a somber tone, more because of the fact that he knew that some animals which were trained by shinobi were capable of speaking; however, in the next few moments the man would probably find out if this one was capable of talking or not. Hopefully, the beast would not act aggressively, and even if it tried, the Uchiha had both of those ebony eyes locked on it, remaining on the edge in case something unpleasant was about to occur. Who wouldn’t be wary when it came towards a large beast such as this, only a fool was probably capable of taking one lightly, without any kind of precautions in case it may start rampaging within the area. Therefore, Tenzō remained still without trying to move suddenly and alert the creature beneath those ebony eyes, awaiting patiently for any kind of reactions on its behalf. The beast hesitated as it peered down at the bloody mess it had caused by ripping open the little creature. It then would crane down and try to nibble at it's little carcass. An extraordinary feeling, growing into such a large powerful body near instantly. It was strange and yet it felt so natural. His hind legs moved just like his human ones would, thinking about taking a step would result in the usual quadrupedal movement that a being with his body would make. If anything, he felt more at home like this then he did as a human. Ikimono, the little bug that had accompanied him from the first day was somehow blended into this large beast form that they had taken. They were of one mind when they were apart but now, they were literally of one mind. They controlled their body together. The pair was continually in sync functioned in a natural symbiotic relationship. They was not sure what to do now, maybe attempt to change back and try to cook it? Their form could probably digest the food raw without getting sick but they didn't really want to stay like this for too long. Their powerful jaws may be able to just crush through the flimsy rabbit's bone if the ate it whole. The large beast perked it's ears up at the sound of nearby rustling. They growled as an unfamiliar presence crept crept closer. The original prey was forgotten with this new occurrence, the beast could feel something strange in the atmosphere.. A new feeling, like a mist of energy that prickled his body. The sound of footsteps was getting closer. And there he was. A large figure of a man stood amongst the ferns, the collar of a dead man's shirt in his clenched fist. The male's posture portrayed someone of relaxed confidence. They were very surprised to see the new arrival, having never seen another human before. Here, eat it. That rabbit is far too small for a large stomach such as yours. He spoke in a low soothing tone after easily throwing the human carcass towards them. The combined pair were surprised at how close the man had approached before they had noticed and also at how easily he threw the weight of the body around. The beast would find this encounter a little unnerving, an atmosphere of natural strength surrounded the stranger. Does he want us to eat him? The large scaly creature glanced from the stranger to the corpse, it's spiny tail twitched back and forth. The thought of devouring a human made them convulse a little. They were unsure about this situation and would back up a few paces, clawed feet snapping branches on the ground. After a few seconds, they decided to try to say something. What resulted in this attempt would be a noise along the lines of a moan changing in pitch. They felt like their throat wasn't fit for speech. Almost at will, the beasts vocal chords started changing. After a large amount of effort, they managed to spit out a gruff No. This is no good, he'll never be able to understand any sort of attempted communication like this. The transformed pair decided to try to revert back to their individual bodies. Last time it had happened by accident so this was a little trial and error. Whilst keeping a careful eye on the stranger, the boy and the bug simultaneously willed themselves to separate. The change started at the head, the bared fangs and spiky armour started to recede. The long tail shrank rapidly and disappeared with a last flick. The torso change was quite laboured, the front part of the body bent into the air and the hind quarters grew hips and knees and then feet. The beast would metamorphosise into a into a boy whose fine features were still being defined. The little bug about the size of half a tennis ball would appear on the boy's shoulder. The kid's eyes still were on the stranger, watching for any action. He realised that he was burning with questions, the sudden arrival of someone who may be able to help them or at least shed some light on what is going on made him itch with anticipation. He blurted out questions at the older male. Who are you. Where are we. Can you help me? Apparently, the beast was able to quickly pick up the Uchiha’s presence, even before the man had the chance of throwing that lifeless body as a meal for it; there was no doubt that the senses of this beast were rather remarkable, or the young man made too much noise while approaching it. Usually dogs were known for spinning up their tail from a side to another, and that was the image which flashed before Tenzō’s own pair of eyes while he gazed at the beast, even though it was nothing alike. Both of those thin and arched eyebrows began arching even further once the beast attempted to speak, as such, the man narrowed both of those eyes in an instant so that he may attempt to discern if there were any kind of words coming from that large jaw that it had. After a couple of sounds which did not made any sense, the raven-haired man was capable of hearing finally a word which expressed the fact that the beast did not wish to consume the lifeless human corpse. After that word was finally gushed out, the young man began hoisting both of those arms in order to fold them against his own chiseled chest, resting those scrawny fingers afterwards upon those well-toned biceps of his. The show did not end there, and it was just about to start while considering that the beast began retracting itself, taking what appeared to be the shape of a young boy with a little critter that was located upon his shoulder. Not a single second passed away and without having a chance of letting out even a single word, the Uchiha was now assaulted by a bunch of questions which left the man with the impression that this young child was impatient; it was rather normal considering that he had so much to learn. Nonetheless, there was no reason to get infuriated or displeased by the situation in which he basically dragged himself in, after all, curiosity did not came without a price. “You’re a bit impatient, aren’t you?” the raven-haired man answered with a rhetorical question, without leaving any kind of pause between this one and the words which were about to follow up. “My name is Uchiha Tenzō, and you are located within the deep forests which belong to the Land of Fire.” he spoke on a calm tone before the man began pacing slowly from his left towards his right, covering a distance of only a few feet while keeping those ebony and dull eyes on the young child. A long-sleeved and jet-black shirt was covering up the upper part of the man, quite simple with no crests or emblems on it, one which complimented nicely those skinny pants that came along which were carefully tucked inside those grey sandals of his. A few stains of blood were also located against the man’s shirt, since he was a bit occupied on this particular day; luckily, the man was capable of finding a few members of the Chantry that he had to dispose of. “Sure, I would help you out, even though I already started by answering your second question. However, please do identify yourself first, and I will be glad to help you.” were gentle words spoken by the man which shortly after came to a halt, remaining still as a statue while he awaited for the young child to answer the one question which he asked. There was no doubt that the Uchiha was filled with questions as well, but the man had enough patience to save them up for later, and first help out this young child. Patience was indeed something which did not came easy, and in most of the cases it was proven to be useful, and with it the man was capable of saving himself from dire situations, which would have most likely ended up with him dead if he did not stood there and analyzed the consequences first before acting. Ikimono chittered into the boy's ear. He was pointing out that Tenzo had some blotches of fresh blood hidden in the dark colour of his shirt. The realisation dawned that he had obviously killed the body in front of them. The bug made a few more clicks while the man paced, the boy understood them like words. Take care, he looks dangerous. Dangerous or not, the boy would not miss this opportunity for information. The sudden need for clarity on his situation swamped any desire for safety. They would take this risk. The navy eyed kid didn't have any sort of qualms with the action of murder, he infact did not have any sort of moral compass at all. Beyond the basic animalistic instincts, he had nothing to go on. He was a complete blank slate in this regard but eating another human still seemed wrong. Maybe this man was hunting humans for his own dinner. It seemed a reasonable assumption due to being offered the meal himself. The man called Tenzo said that he would indeed help them if they identified themselves. The boy furrowed his eyebrows, his eyes left the larger figure and focused on the twisted corpse on the ground. It seemed like the man would not trust him before giving his name but that was a problem. He glanced at his friend on his shoulder and they came to a silent agreement to tell the newcomer about their strange appearance. The nameless boy removed his black and gold cap and ruffled his oily black hair as he tried to find the right words. Well you see.. that could be a problem because I don't have a name. Me and Ikimono here woke up a few days ago in this land and have no memory of anything before that. So I don't know who I am, that's why I really want some answers, this is all quite frightening. He realised how mentally drained he had become with all the stresses of this new environment, security was a comfort that the pair craved. Ikimono clicked a greeting that would probably not be understood by Tenzo. We certainly are glad to see you here, thanks for helping us. The boy and his animal companion truly didn't know what to expect, everything was new and surprising to them and yet.. it was all familiar. Situations that presented themselves for the first time were somehow manageable like their bodies were able to respond to them and react appropriately without conscious command. The man let out a deep and heavy sigh escape between his own pair of pale lips, and once it was over, those hands slowly began lowering themselves around his body. “You’re saying that you don’t quite remember your name; however, you seem to recall the name that your little pet has.” Tenzō spoke on a calm tone before taking a few heavy footsteps forward, relocating himself a bit closer towards the young boy. Even though the man probably left the impression that he was heading towards that oddly pair, things did not really go that way, as such, the Uchiha halted around the corpse before crouching down in order to perform a couple of consecutive hand seals. Once they were finish, the young man would mumble of few words while pressing his right hand upon the corpse, in order to use the body elimination technique which he was taught as an ANBU. In a couple of seconds, the body was no longer on the ground and there were no more traces of him besides the bloodstains which chose to remain behind on the Uchiha’s jet-black shirt. As such, the raven-haired man arose once more in order to dart those ebony eyes against the young child. With each day passing by, the young man improved himself when it came towards using the techniques that were passed on to him while joining the spec ops; however, the man was still a rookie and there were many more things that he needed to comprehend. “Nonetheless, what did you needed help with?” he asked on a curious tone while gazing at the young child who stood beneath his own pair of eyes. The nameless by shuffled uncomfortably underneath Tenzo's gaze. The larger male remarked that he knew his little friend's name but not his own and then started forwards. The boy was nervous that his explanation would not be enough to give his story credibility. Well, I gave him that name.. He likes it. I didn't really think I needed a name. Also he's not my pet, hes my friend. The bug chittered in agreement and wriggled it's webbed feelers. The pair had only been together a short while but they had already become very close. He couldn't describe it, their bond felt like some sort of hidden connection. They never considered going their seperate ways, staying together only seemed natural. Tenzo stopped when he was in front of the body, bending down to it. He would then manipulate his hands in a flurry of strange motions. They peered at him, curiosity piquing. Suddenly, the body burst into bright blue flame. The scaly bug and fleshy boy simultaneously squeaked and jumped backwards, startled at the sudden disappearance of the corpse. Ikimono almost fell of his shoulder, little pinsirs scrabbling back on for a hold. The flames slowly ate into the body, disintegrating it and leaving nothing behind. Nonetheless, what did you needed help with? Wh-what was that? The sudden occurrence had rattled the pair, their focus now entirely on the seemingly spontaneous combustion of the corpse. How did you do that? Ikimono clicked wildly, saying the same sort of questions. They had a lot to learn in this world of ninjas. In his own thoughts, the raven-haired man began thinking the possibility that the young child might have lost his own memory due to an occurrence of some sorts, a thing which was also hinted by the fact that he was not aware of what were hand seals. In spite of all of this, the Uchiha agreed to help him and that was going to happen for the next couple of minutes; perhaps, there were thing that the man could also learn from this boy. A faint and hearty chuckle escaped between the man, echoing slightly throughout the forest which was in response to the eagerness which this young child had for learning new things, one which could be found within himself as well. Tenzō never really imagined or considered the fact that someone could consider his own pet as a friend, and this thought remained with that skull of his. Hopefully, the raven-haired man did not offended the little critter with his own words, if it was capable of understanding what the man said. There was no doubt that the two of them were capable of communicating between themselves, and the synergy which was between them was something remarkable indeed. “Uhm, what? You mean my hand seals? Those are common within the likes of a shinobi, I thought that someone who’s capable of metamorphosis might know something about the.” the Uchiha stated while gazing with those ebony eyes against the young child. “First, there is a thing called chakra, an energy which can be found within our bodies. Those hand seals are there to help us manipulate it, and with them we can form different kind of techniques. However, there are some which don’t need hand seals at all. I could probably give you some books about it, do you know how to read at least?” the raven-haired man stated while leaving an inquiry at the end, so that he may find out what would follow up next. There were a tons of question which needed to be posed in a situation such as this, since the young child probably had parents which were most likely waiting for his return back home. However, it was still too early to discuss things such as this, so probably the best thing was to wait and see what the child wished to find out; tis going to take a long amount of time. This Uchiha Tenzo did not seem to think that this incident was anything remarkable in the slightest. When questioned about how he had made those amazing bright blue flames appear around the corpse, burning it into nothingness, he responded with strange terms. Hand seals, shinobi. Both of these things must be common place in this land. They could figure that hand seals referred to the way that he wiggled his fingers and wrist around just before the flames were conjured. He had no idea what 'shinobi' could refer to. The strange man had also mentioned his shapeshifting and how that meant he ought to know about whatever action he had just taken. Could my ability have some sort of link to that- whatever that was? They were completely intrigued. A lust of knowledge fell over them. The boy stood on one foot and itched his ankle with his toe. A weird balancing act by a wide eyed child. He said simply: Tell me. An energy in our bodies.. used for "techniques". The pair listened intently, soaking up the knowledge. The forest around them seemed to quieten as they focused singularly on this information. Do I know how to read. He repeated back absent mindedly and then snapped back to answer. Oh uhh, yeah. When the slight boy thought of the word books, he could recall an object made of paper that had writing inside. How come he knew what books were but not this "chakra"? Did they have this same chakra? He had an inkling that this was connected somehow to his abilities and maybe even his origin. When they had combined and changed, the both felt a toll on their bodies. Like their strength was drained. The little kid furrowed his brow as Ikimono scurried up his neck and sat on his head. He doesn't seem to understand me, ask him about if there are other people. The boy passed on the question. Is there other people in the Land of Fire and can they do these techniques as well? I would love some books or something. I want to know as much as I can about this land.. is there anything important I should know? What's the world like? The pair were rooted to the spot. The gnawing hunger was a distant memory compared to the want of information. Tenzo seemed like a kind and trustworthy man. Both of them counted themselves lucky to have had this chance meeting. “Hmm...” the Uchiha hummed while gazing at the young boy’s new expression which furrowed while awakening a thirst for knowledge, and as a response the man was quite intrigued how far were the extents of his own abilities. “Well, as a first. There are other people in this country, and not only in this one but the others as well who are capable of performing such techniques. If, you would consider visiting my village called Konohagakure, than you will have the chance of finding out books at the libraries which you could document yourself.” Tenzō spoke on a calm and a gentle tone while crossing both of those arms once more against his own chest. Most likely, this particular child had suffered a memory loss from a concussion or another kind of interaction, since there was no way that he was capable of learning to read on his own; however, if those memories were to come back, the raven-haired man would be quite curious to see if that personality of his were to change. With a few heavy steps, the raven-haired man relocated himself around a nearby tree and upon arrival, the man lashed that spine of his against it, leaning on it as those eyes shifted back towards the young child. The Uchiha was a bit tiered from the earlier hunt in which he disposed of a few members that were connected with the organization that was involved with the death of his own sister, and knowing that they’re going to fall one by one, Tenzō was capable of easing up that pain which shrouded the man’s heart. Nonetheless, this was not the time to think about such things and the man let out a deep sight before continuing on with the explanation. “Before we talk about the important part, I want to first let you know about the world. Most of the people who work within villages and are capable of performing techniques such as me, are called shinobi. But, there are also shinobi who abandoned their village in order to pillage, murder or perform other kind of unhealthy activities. Those are the ones that you should be wary of, and the chances of encountering them while roaming outside a village are rather high.” were the words which came out from the Uchiha while the man scattered those ebony eyes around the vicinity to see if there was someone within the area, and once they were finished doing so the man was capable of concluding that their discussion was safe and there were no prying eyes within the area. The two new acquaintances looked into each other. The boy's skin prickled under the gaze of those ebony eyes. It was a tense moment for the boy, his harboured anticipation wasn't easily bottled. He held his breath whilst Tenzo hummed. He was told that there were indeed others in this country and that they could use these techniques. The man came from a village called Konohagakure and mentioned that he could find more answers there. They continued to hold each others gaze. The boy's mind slowly pondered on the thought of the other people in this world. What were they like? What strange powers did they possess? The man belonged to a village, a collection of people. The two young friends didn't know if they belonged anywhere, if they could belong somewhere. The people who were part of these villages were indeed capable of the same sort of techniques and they are called shinobi. But apparently some people had left these villages so that they may do what the sitting man described as 'unhealthy activities'. He was saying that it is dangerous outside of the village. Tenzo would then flick his eyes around the surrounding area. The boy gasped and the bug squeaked. The quickly turned and peered into the woods in one direction and then the next. They could be in danger in this land. Thoughts of patient predators hiding themselves amongst the brush, waiting for them to sleep so that they may spread the blue flames of death over their helpless bodies. The young male started lightly hyperventilating, he turned back to Tenzo, wide eyed. They didn't know what was possible in this world. What should we do? What can we do to protect ourselves? The pair were very thankful that the man that had come was not one that was going to harm them. What they needed now was to prepare themselves for any of the eventualities that now troubled them. A thought struck the boy. You said murder was an unhealthy activity.. I assume it was you who killed that man. Do you have to leave your village now? They weren't scared of Tenzo, if he wanted to do ill to them, he would have already made a move. At first, the young man started believing that the child was capable of learning since he stood there silently while the man relocated from a spot to another, soaking in every piece of information that was being place forth, like a sponge absorbing water. “To protect yourself, that is a tough question. Not even I can protect myself entirely, so the best piece of information that I can offer you is to be wary of who you keep close to you, listen to your little friend, since he does seem to want your wellbeing.”the man spoke on a calming tone while scattering those eyes on the ground beneath, pondering on what else to say in a situation like this. A slight pause will follow afterwards, in which the Uchiha would leave the young child to think about those words that he said, and after a couple of seconds the young man pushed himself from the tree before facing the direction in which Konohagakrue was lingering. “Killing isn’t something right... nor wrong. No, I do not have to leave the village, since he was not a shinobi from my village. That man that I just killed, was involved with the death of someone dear to me... which never thought about doing anything wrong, yet...” the raven-haired man spoke before interrupting himself, since this was not the time nor place to speak about such a subject which will most likely infuriate him intensely. A turmoil was going on within the Uchiha’s mind, and the man was going slower towards a patch which would not end up that well for him; the ones around him were the only ones possible of placing him back on the right path. The future was really uncertain and unknown, it was always full of surprises and the life which this young man was living could be associated with uncertainty and randomness, not all things were capable of being predicted. “You’ll need a name if you want to get inside the village, I think Daremo is a good one for now, you could change it later if you desire to.” the Uchiha said while taking a few steps forth, passing by the young child but halting just so that he may turn that head against him on more. “I’m heading towards the village right now, if you wish to follow me than feel free to do so. Konohagakure can offer you a lot of things, such as books, food and not only that, as such, do you what you wish, since you’re free to do so.” were the last words that came out between those pale lips, since the man started making his way back to the Hidden Leaf Village.